When I faced with My Account menu first time, my client asked me to add a custom link to it. I was surprised that this task was not so simple as it sounds. 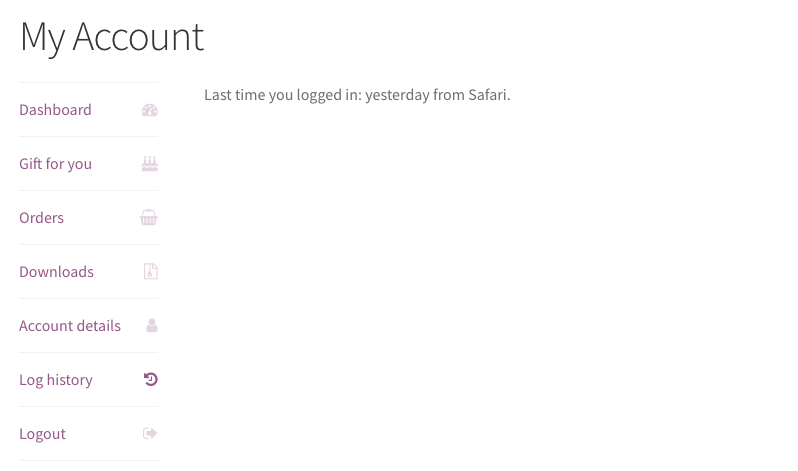 This is how “My Account” menu looks by default. How to Remove Tabs from My Account menu. How to Remove their Endpoints as well and Make the Appropriate Pages to Return 404. Probably, it is the most easiest part of this tutorial. For example let’s imagine that our e-commerce shop doesn’t sell physical goods – and in that case maybe we do not need Addresses section (yes, I know that Billing Address details are also there, but we’re just learning now). Or maybe you want to remove Downloads from WooCommerce my account menu. Both are possible. It was simple enough, but we have not finished yet, if you go to /my-account/edit-address/ directly, it will show you Addresses page. This should not happen, should it? The first thought that came to my mind was to remove endpoints somehow. Dealing with $wp_rewrite or something like that. Please do not! The above code is good. But when you want to remove both the menu item and its page as well, you do not need any coding. You can find all the default My Account subpages in WooCommerce > Settings > Account. All you need is just to set a specific endpoint empty. Can be done with the same woocommerce_account_menu_items, all you need is to know a tab ID you would like to rename, all of them were mentioned above. There is no specific filter for that but I will show you a very simple trick. In the first part of the code we will add a new element to menu items array (if you have experience with adding columns to admin Dashboard earlier, this code will be familiar to you). In the second part of the code we’ll just hook its URL. But what about the menu icon? If you use WooCommerce StoreFront theme, this question could appear in your mind. Really, how to add your own beautiful icon there? Let’s begin with the point that StoreFront uses Font Awesome icon collection. So, go to their official website, choose any icon and find its unicode code. Well, this part of the tutorial is also simple enough and consists of 4 steps. Sometimes people forget about 4th step, but it is as much important as the others. // Go to Settings > Permalinks and just push "Save Changes" button. I also took care of the icon. Now, if you go to /my-account/log-history/ or click the appropriate menu item, this page should appear. Actually this is all I wanted to show you, but below is a small bonus. So, using the action hooks below you can add any text or HTML code just before and just after the menu <nav> element. But I want you to keep in mind one thing – this may not be so simple as it seems, because in most cases the My Account <nav> element has float:left CSS property. Thank you for reading! Subscribe below if you want to receive new awesome WordPress and WooCommerce-related content once a week. Or leave a comment if you still have unanswered questions. thank you for your time for making this. I have a question and I´m struggling with it quite a lot. Basically, I would like to rename titles on the rights like Downloads etc. Currently I have Membership but I would like to rename it into something else. … and one more question, how would I remove collums from Download page? Here I´m reffering to Expires and Remaining downloads. Many thanks for your time, and wish you all the best in 2018! 1. Please clarify what titles would you like to rename? Only Membership or.. ? awesome, that worked perfectly! Thanks for this really appreciate the help! 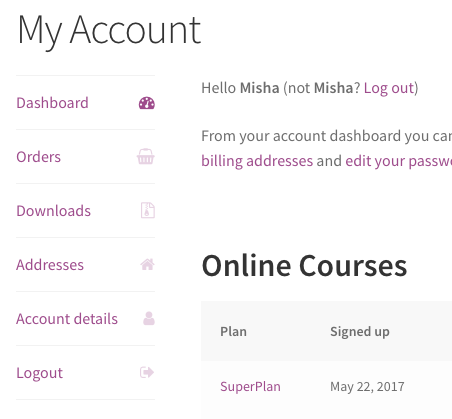 Yes only Membership plugin name under My Account page, and would like to rename it into Online Courses. Is that possible? Could you please clarify what membership plugin do you use? WooCommerce Memberships or…? P.S. You can always do it with jQuery by the way. It works! Amazing, thank you very much Misha! I was posting on forums and even asked the guys who did the theme but without any answer. I own educational website as well so this really means a lot. Is there a way I could donate you? How do I change the order of membership menu in functions.php? Do you have any idea? wondering regarding the breadscrumb, is not taking it. any thoughts? On line 5 log-history is the rewrite endpoint that we have added in the tutorial here, Step 2. Hi, Great help thanks with this code. If I want the endpoint url for the extra tab to be changed say from /my-account/log-history/ to /my-account/email-preference, how can I do this please? Just replace log-history everywhere in your code with email-preference. Very good your post. I have a question. How do I set the menus to be in the fourth position between “download” and “Account details”. I think something like this should help you. Any idea how to remove the “Sales summary” widget from the Dashboard tab? (WC product vendors, WC bookings add on). Or how to remove the Dashboard tab all together.. I have a booking website that does’t sell any products and this widget has stuff like top seller, out of stock, in stock etc confusing my vendors. Super useful tutorial, thank you! Is there a way this is not accessible. Or people can be redirected to orders page. Hi Misha, this is great. Is there a way to have the new item I’ve added to “my account” page to appear only for specififc user roles? Misha, this is awesome! Great post and very informative – thank you so much! I have a quick question that I can’t seem to find the answer for: On the My Account page, going to the shipping fields, I have a phone number field (shipping_phone) that I cannot get rid of or edit using the WooCommerce Checkout Manager because it does not show up. Any idea how I can either get rid of said field (or, ideally, just change it to “right” instead of “wide”)? 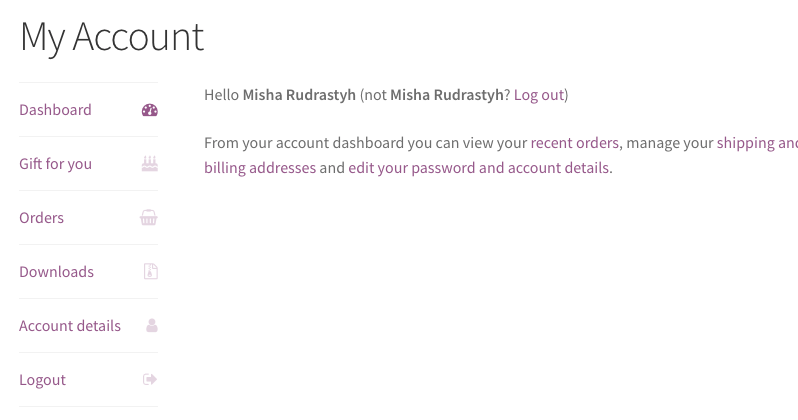 Please clarify one thing – do you want to get rid of the phone field on the My Account page or on the Checkout page? The one on the My Account page. I have my billing address setup just fine, but the shipping address is forcing the phone number to be a whole line instead of the left/right option I’m searching for. Ok, how did you add the phone field? Because by default there is no phone field on the Edit Shipping Address page. I have added a new phone field on the shipping address to be able to sit next to the zip code field as I’d like it to look, however the full width phone field at the bottom is being placed into the form on its own. Thanks for all your help, Misha! Ok, the first phone field is added with the plugin WooCheckout, but how the second phone field is added? You have to figure it out. It is not placed into the form on its own – by default there is no Phone field in Shipping address at all. Try to switch your theme and deactivate plugins one by one and look if it is disappear. I want to show the user_id before the navigation but it does not work. Maybe this is not the really right way (so please let me know) but it works. Thank you for this tutorial. I’m trying to put all woocommerce related plugins into woocommerce account. These plugins would usually create their pages but I want those pages to be inside woocommerce account. which of the sections of your tutorials should I use? Add Items with custom URLs or Add Items with My Account subpages. I’m thinking Add items with custom URLs? and if it’s subpages can you show me exactly what to use to bring those pages under my account in place of (the echo ‘Last time you logged in: yesterday from Safari.’;) in your code. I’m sorry, but your task is not 100% clear for me. Could you please provide a specific example? i have Created Link Support in My Account But It will load separately. i want to load under same page. What do you mean “separately” ? But once you did it, go to Permalinks settings and just click Save Changes button. Hello ! Thanks for the tutorials ! I just copy paste your code and changed the Url but I have error 500 when I go back to my website. It’s seems that I have a problem with how I write the url in the code. Can you give an exemple ? How you write your URL? Hi , it worked actually ! But could you explain to me how you place the new page wherever you want into the dropdown ? I don’t understand the array_slice code. I already have 8 tabs and I would like to add a customized tab on the 3rd position. For now it’s on the middle. Sorry, but It’s not working. Please contact me by email on the Contact page and I will try to help you. Is it somehow possible to change the text on /my-account page by adding a filter? What I need to do is to hide the “manage your shipping and billing addresses” phrase. But please note, that remove_action in this situation could remove something useful added by another plugin. Did I understand you correctly – do you want to change “Orders” menu link anchor? Nice blog. !! and thanks for the function. can you please tell me if I want to use function twice (Add My Account Menu Links with Custom URLs) then what changes I have to made in 2nd hook? Thanks for your feedback. Well I did complete duplicate of the function. well I will try this one too. hi misha, thanks for your great article, it helps me well. how can i add new menu (endpoint) to my account page, let’s called ‘Confirmation’ (in this menu, i want my customer to upload conformation for their payment, i.e. bank transfer recipe screenshoot). i use plugin called ‘WordPress File Upload’ as it can build upload form. 3. customer go to ‘my account’ page and click ‘Confirmation’ menu made custom. 4. on ‘Confirmation’ section, there is form : Order ID and upload button. I can help you with the code, just contact me by email. Hi, thank you so much Misha was helpful!. How can I open my custom link in another page? Thank you so much Misha! Una cerveza corona para ti! How can I change the text color of the custom link on my account? Hi there, I just found your post. Very easy to follow and super helpful. Thank you! The new menu item is appearing, but when I click on it, I get a 404 error. Any thoughts on this? Thank you! Doh! Nevermind, I figured it out….I forgot to clear my cache. Thank you again, great post! How can i add a shortcode in the content of the new tab? what should i insert inside the ()? could be (my-account/gift-for-you)? You should practically put in quotes the name or url of the page that you want to link. This was extremely helpful, thanks Misha! Hi Misha, I appreciate you for taking the time to create this extremely timely and informative post as this is the very issue I am running into currently! I am curious do you know if it is possible to integrate the membership menu items into the main account menu? I would like to have one navigation rather then have the items under the membership menu buried like they are. Thank you in advance for your response and please have a fantastic day! I think it is possible, but clarify please what membership menu items do you mean? Currently the structure is to get to the sub-menu I would like to move to the main account menu is under the memberships menu item on the main account menu. I hope I am making sense and again I appreciate your time in responding to my questions! Memberships > click view button under the membership tier you are a member of > then you finally get to the menu I would like to move. I would like to move the above membership menu items out to the main account menu or have a link to that membership on the account main page that will only show if you are a member of two certain membership tiers. But I think I can help you, please contact me. I want to redirect the social login users to be redirected to the shop page. I just redirected woocommerce login and registrated users to the shop page using your add functions in function.php folder. This info was very helpful … thank you! Now I just need to figure out how to restrict visibility of the added link to a specific user role, preferably without using an added membership plugin. Any suggestions? Thanks Misha … that seems like the type of thing I’m looking for, but I can’t quite figure out where to insert it in my snippet. In my account page i want to make login for specific customer, and after they login i want them to redirect to their products page only but unfortunately i am unable to do it, every time clicking on return to products all the website products appear. Hi guys, Can anybody help me out How can I add hook to show User Icon instead of myaccount link in header part? Just like woocommerce cart icon in Header. . . I add this code in functions.php, it’s working but it have some CSS issue. What theme do you use? How the My Account link is displayed? With menus? This was an extremely useful tutorial. I was wondering is it possible to have different My Account menu elements based on the user’s role? In my case I have ’employers’ and ‘candidates’ and the latter should not see Orders. Hey, thank you for this wonderful piece of work. At this section- https://rudrastyh.com/woocommerce/my-account-menu.html#add_with_pages I want to add up to three menu with there own content, how can I do it in one snippet without coppying and modify each time I want to add another menu with its own content? Hi – I want to use the code you have above in the section entitled “Add My Account Menu Links with Custom URLs “. I know nothing about php, but i added it to the child them functions.php and it works – but the custom link shows up second in the order, as you intended. What do I need to change to make the custom link show up between two different links, for instance 4th in the order instead of 2cd? or 12th? What is the name of file where add this code? I think, if you are not using your custom theme, the simplest way is to made a plugin and put code there. Man, this is the best guide, I’ve seen so far. Others use four times more code to achieve the same result, as you did in an elegant way, thank you for sharing. Go to Settings > Permalinks and just push “Save Changes” button. When you add this functionality in your custom plugin or theme, there is no way to ask the users to go to Settings and do something. So, flush_rewrite_rules(); will help you with it. But do not add it directly to functions.php because this function must be run only once! What Custom plugin can we add this, because I use My Custom Function plugin to add any tweaks to my site. So, could I still use this and should be at the beginning or end of the editor? You can use it in your main plugin file, between <?php and ?> and not inside any other functions. yea, I figured it out. Works perfectly. I got this setup pretty well but the content isn’t showing at all. Confused as to why. Ah never mind. I got it. I was changing all your log-history stuff and missed the endpoint part. Great tutorial Misha, thanks! Thanks. Hey, have you ever done a child tab? We are creating a Rewards program with YITH’s plugin and I’d love to have a child tab under theirs on the dashboard. So when a user clicks on the Rewards tab a Rewards Rules tab slides down. By the way, this WooCommerce functionality doesn’t allow that, but it is possible to do the following way. I think it is allowed. YITH actually has an entire accordion when you sign up for an account with them. Check theirs out. That’s what I’m actually coding now. I didn’t say it is not possible. I meant just that WooCommerce default hook woocommerce_account_menu_items doesn’t support child items. I can publish a tutorial about that, if you want, but it will be on Thursday. No need thank you. I already coded it. Thank you though. No problems. Maybe I will publish it anyway, so you can compare the way you did it. I found this article very useful! Thank you very much for sharing. I was wondering, I really liked the Gift idea since i’m planning to give users that already bought items in my store some discounts. Do you recommend any plug-in to do so? Usually I do not use plugins. But similar functionality you can find in this tutorial and check out this conditional function: wc_customer_bought_product(). Thank you for this article. It is very useful. I just want to ask a very basic question. “My Account” default look is not same with yours. I mean at my side content part is below navigation links (this is important for me) and i can not see any icons on my navigation items. And also the colors are not purple like yours. Could you please explain me why this is about? I’m interested in adding 2 custom links to the my account page. I have used your php snippet but I don’t know how to change the final part to use the array of links defined before. Thanks a lot Misa, this answers my question, too. I have no knowledge of php and I was finding very hard to guess how to do it. When you click the links the h1 tag changes (ie. “My Account”, “Orders”, “Account Details”, etc.). But it doesn’ change for the new custom tab inserted? Everything seems to be working fine except that the title tag is not updating. I have flushed permalinks and flushed cache. I have tried your suggestion, but it is not changing the title on the newly created endpoint. Strange, for me it works. Maybe the title is hardcoded in your theme. $title == 'My account' when I change it to $title == 'My Account' your code changes the title. But I run into another issue is that I have a link in my top nav bar entitled “My Account” and it changes that link name as well. Just go to Appearance > Menus and manually change it there. I’ve got a new menu with a specific new filed for the user account. How can i save this changes with a “save changes” button. Your form tag should look like <form method="post">. Then save your changes from the $_POST variable. You can do it within template_redirect. AJAX is an option too. Thank you Misha for your fast replay. How can I open it in a new tab? Thank you so much for this code, Misha! This has been very handy in adding a custom URL to our customers’ account page to process their own returns. We are using Custom URL code, and am curious how one would go about making that custom URL open in a new tab, as our return processing is handled on a different site. jquery it is. Thank you very much for getting back to me in spite of my over-looking of the comment above. Have a great one! Does someone has figure out how to get My Account Menu Links with Custom URLs to open in a new tab? I saw they said using jquery but I couldn’t make it work so far. 1.) How do I have to set the url for an internal WordPress site? Do I have to set the complete url, the page id or something? 2.) Is it possible to change the first page displayed? I want to hide the dashboard an make another menu-point the first one. 1) Yep, the complete URL, you can use site_url() or home_url() for that. 2) The code below works for me. great – thanks a lot! Everything works fine with your help! What can I change to have a custom URL in there? $url = 'https://rudrastyh.com'; would be ok.
First a happy and healthy 2019. I have edit some of your lines like below. I thought with these extra lines I could get rid of these links, but whatever I try, they seems to be unmovable. Can you advise please? Does anyone know how to add an icon next to the cart icon in the header of storefront that will lead to account sign in page? You definitely can do it with the URLs like this /my-account/sale/?page=2, not sure if it is possible to add one more rewrite endpoint with add_rewrite_endpoint(). Maybe someone will be interested in how to do it. All as in your manual, except for the pair of moments. First we have to create and include our file, coz the raw code inside won’t work for the pagination. 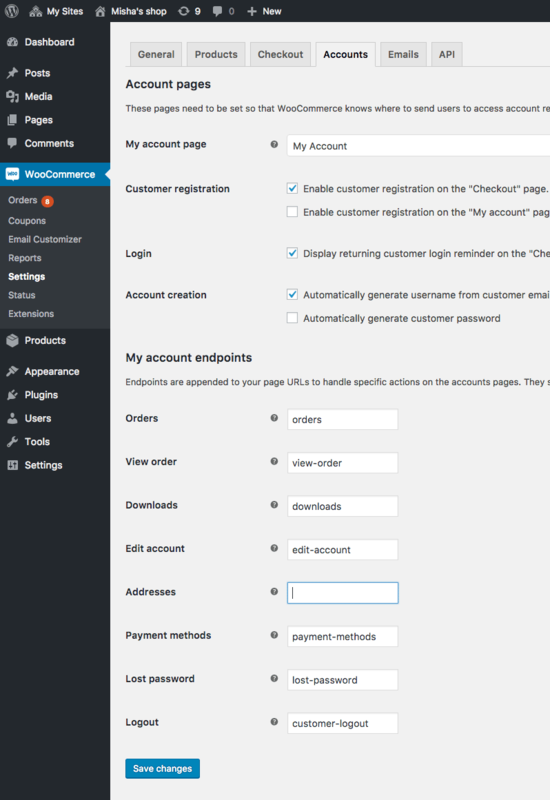 For some reason I can’t find the account endpoints anywhere in the Woocommerce plugin. When I go the Accounts & Privacy tab it’s no where to be seen. Any idea where it might be? Thanks for the easy css to add Font Awesome icons to My Account!